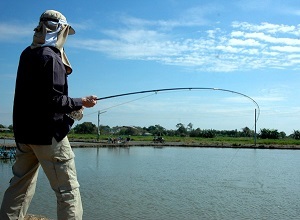 Chinese Lure fisherman Kevin Teo visited the Barramundi fishing ponds in Chachoengsao a short distance from Bangkok. On arrival at the fishing complex Kevin chose to use a Top water lure fished in conjunction with braided mainline and a light spinning outfit. Immediately the angler began to experience savage strikes from the highly acrobatic Barramundi which aggressively attacked the anglers surface lures. Adopting a roving approach the angler fished several of the various ponds located on the complex catching Barramundi in the 2.5-5kg region. Regularly changing his lure pattern saw Kevin bagging up at each pond with the fish performing spectacular aerial displays in an attempt to shake free the hooks! After a short break at midday the angler resumed fishing on one of the larger ponds hooking several larger specimens weighing upto 6kg’s. Changing tactics paid dividends for Kevin who worked lures at various depths and rates of retrieve amassing a thirty fish bag of the hard fighting sport fish in a short six hour session. The Chinese angler captured six fish over 5kg’s with the largest specimen of the day weighing just over 6kg’s. Poppers and surface lures proved to be particularly effective on this occasion with all the bigger fish hitting lures carefully teased across the surface.